The report, which examined 20 million unique devices between Sept. 20 and Oct. 18, says that there are now 2.3 active iPhone 5s units for every iPhone 5c globally, down from 3.3 units one week after the handsets' launch. 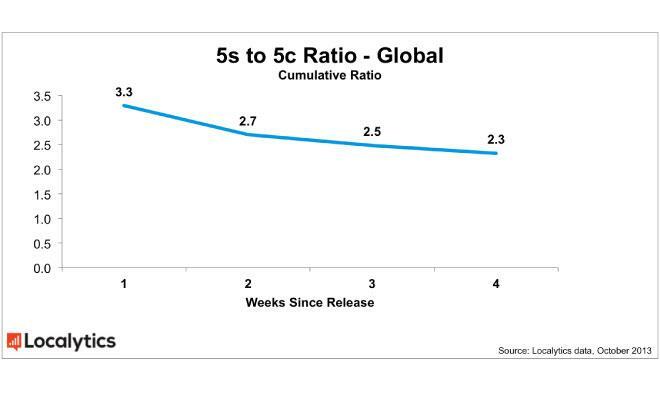 The numbers are even tighter in the United States, with the iPhone 5s-to-5c ratio dropping from 3.0 one week after launch to 1.9 today. The iPhone 5c's apparently increasing popularity flies in the face of reports of lackluster sales and slashed production orders for the colorful device. Continually constrained iPhone 5s supplies may be contributing— Apple retail associates said in September that "the 5C is quite good and a lot of customers who can't get the 5s haven't minded upgrading to a 5c." Meanwhile, Apple's iPad 2 continues to be the most popular iPad, accounting for nearly 40 percent of active units. 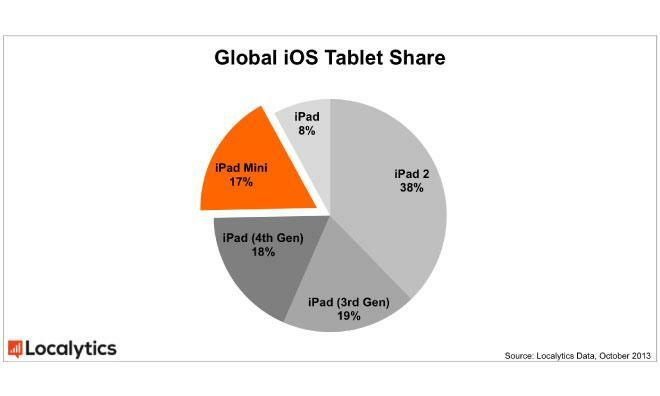 The iPad 2's 38 percent share is more than that of the latest iPad 4 (18 percent) and iPad mini (17 percent) combined, according to the data. The iPad 2 featured an all-new industrial design, and subsequent revisions to Apple's tablet have added higher-resolution Retina displays and incremental hardware upgrades. Localytics suggests this may be a factor in the iPad 2's continued dominance, saying it is possible that "perceived differentiation of the latest-generation tablets is getting smaller with each new release." Apple is widely expected to unveil a redesigned, slimmer fifth-generation iPad on Tuesday in what one analyst called "the most important refresh of the iPad franchise...since the first iPad went on sale." Cupertino is also— controversially— rumored to show off a Retina display-equipped second-generation iPad mini at the event.